Neighborhoods across Franklin continue to experience a high number of auto burglaries. Most are preventable, and we need your help. Most of these auto burglaries are happening during the overnight hours and, in most cases, valuables (including guns) are stolen from cars left unlocked by their owner … even cars parked in their own driveway. In some cases, these crooks find keys in an unlocked vehicle, and steal the entire car. 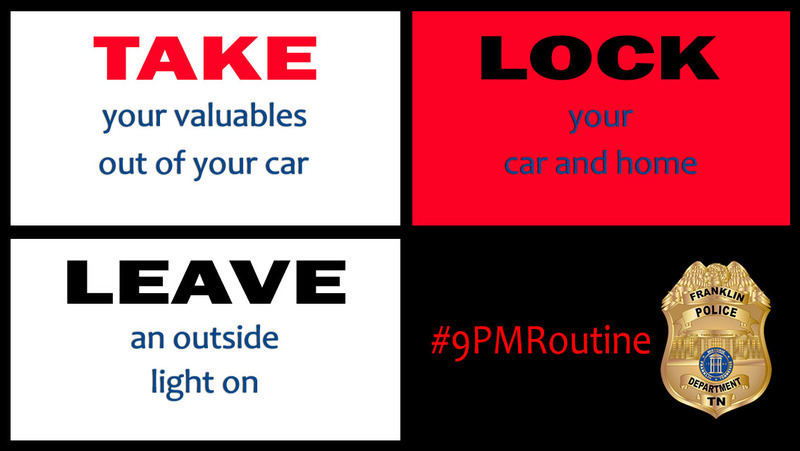 Please, PLEASE remove your valuables and lock your car doors. We should never make it so easy for criminals to be successful in our own neighborhood … because when you do, they will be back.